Week two of Project Run & Play is here and the theme is Let’s Go To The Movies. This is always a fun challenge. You are to pick a favorite character from a movie and design a look based on your inspiration. My husband and I watched the live performance of The Sound of Music when it aired on TV and though it was really entertaining, we had to watch the Julie Andrews version a few days later of course. I saw that movie so many times growing up and it’s amazing how many new things I pick up on each time I watch it as an adult. When Carrie Underwood’s Maria came back to the von Trapps after running away to the Abbey she and Captain von Trapp talk about her new dress and how it was the most recent postulant’s worldly clothes which are normally donated to the poor upon entering the Abbey. I had never really thought about where Maria’s “civilian” clothes came from so when we rewatched The Sound of Music I was paying closer attention to those later scenes. 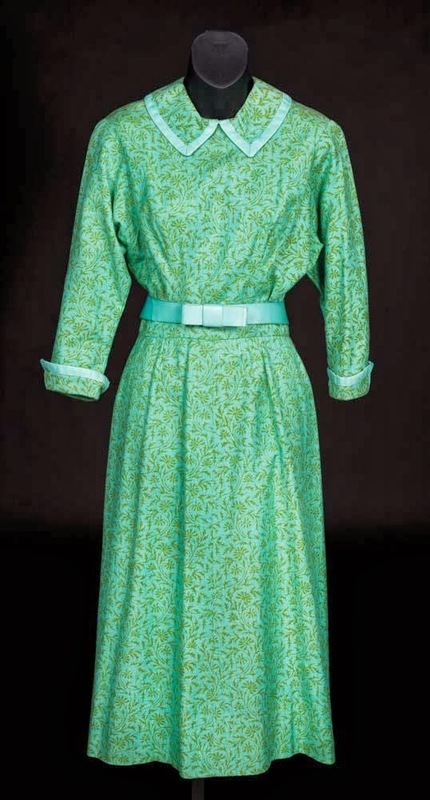 The dress Julie Andrews’ Maria is wearing upon her return is this gorgeous turquoise and green belted dress that a postulant is clearly wearing in a previous scene. There was something lovely about the color and that collar immediately caught my eye. 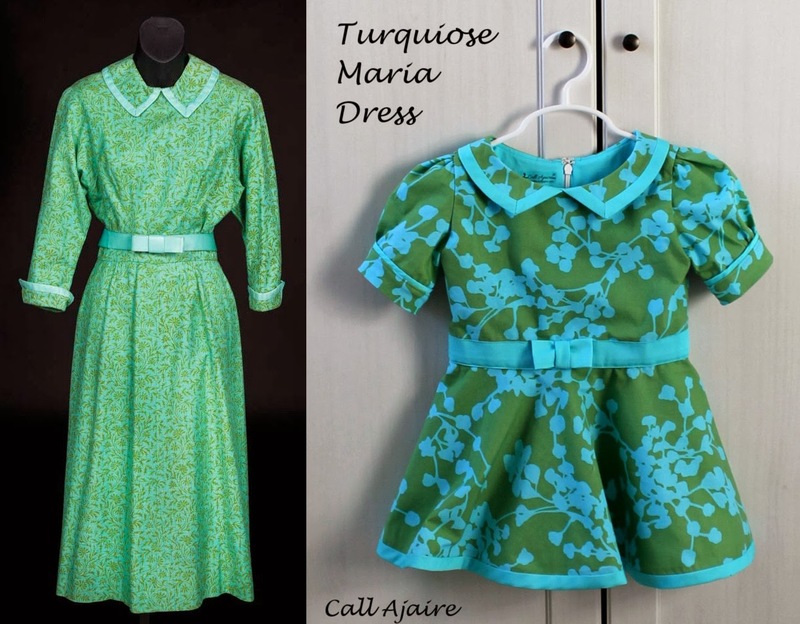 I wasn’t thinking about Project Run & Play themes at that point, but recently when I was going through the weeks and deciding what I might make I knew I needed to make a Turquoise Maria dress for this week’s theme. This is the first dress in awhile which I have drafted from scratch. It’s always fun to see something through from start to finish, but I often find I don’t have the time. Kids grow so quickly so it’s hard justifying making a sloper which might only be used once or twice. It was so satisfying though. I’ll have to remember that. This Amy Butler fabric has been in my stash for ages. I used a small bit for a purse years ago and forgot I still had some left. I thought it was a great match for Maria’s dress. Not an exact copy, but a bit more youthful with its larger print. This was my favorite color combination I’ve sewn with in awhile. The contrast of the solid turquoise really makes the green stand out. The dress started with a 3T size bodice with a little extra room thrown in so it’ll fit for longer. I really like the idea of this being a top later this summer. The bodice is fully lined so all of the inside seams are hidden except for the skirt back seam below the zipper and the bands on the sleeves. Since I was thinking this would be a top eventually I didn’t want to line the skirt and I find a lined sleeve can be a little too bulky. 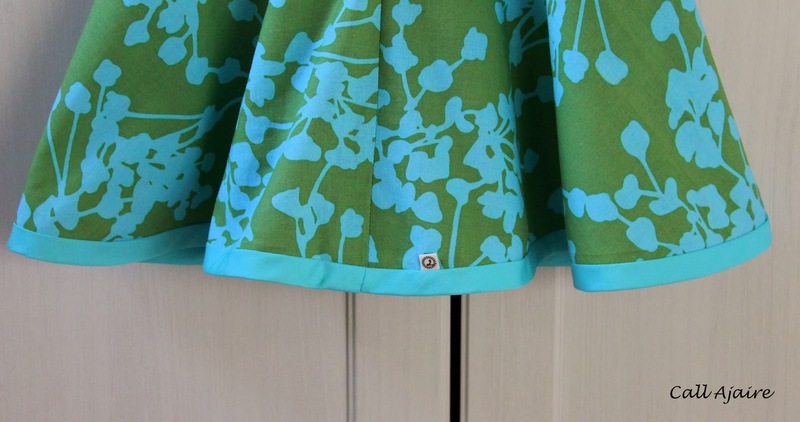 The skirt is a 3/4 circle skirt. It looked like the original Maria dress may have been gathered, but I don’t make too many circle skirts and I thought drafting one to fit my drafted bodice would be fun. I was kind of shocked when everything lined up perfectly the first time. The skirt is a bit short, but again I really only intend Bean to wear it as a dress while we’re in these cold tights/leggings days and when it warms up I think it’ll be adorable over some shorts. So I wanted it to be a bit mini right now. 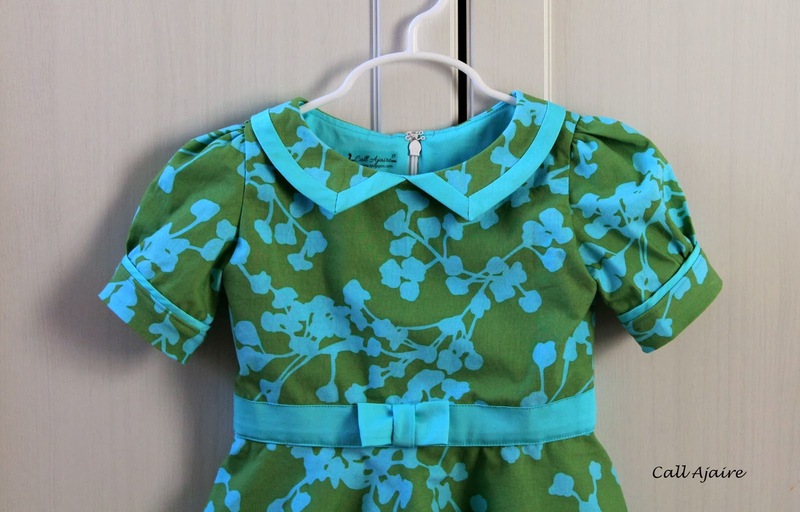 The sleeves are gathered at the shoulder and at the band which is one of my favorite little girl styles. I guess I’m partial to a puffed sleeve after reading (and watching) so much Anne as a young girl. It’s a style I don’t think I would ever wear myself, but I love the way it looks on Bean. The bit of binding that sticks up between the sleeve and the band is a nod to the original dress. And speaking of the original lets get back to that collar. I thought those angles were so lovely so I tried to recreate them but just a bit smaller and with a little less drama. Binding around those points wasn’t the easiest, but I’ve bound a lot of quilts in my day so with all of that practice it went relatively smoothly. I also used an invisible zipper foot (*affiliate link) for the first time and I have to say I am in love! I had no idea such a thing existed. I’ve been sewing “invisible” zippers since I was a tween (way back before that word even existed, hehe) and half of the time the zipper itself was just a regular zipper let alone the sewing foot I used. The standard zipper foot has always worked fine for me, but there is a lot of basting and planning involved to get a really nicely done seam. But all that is for another post. 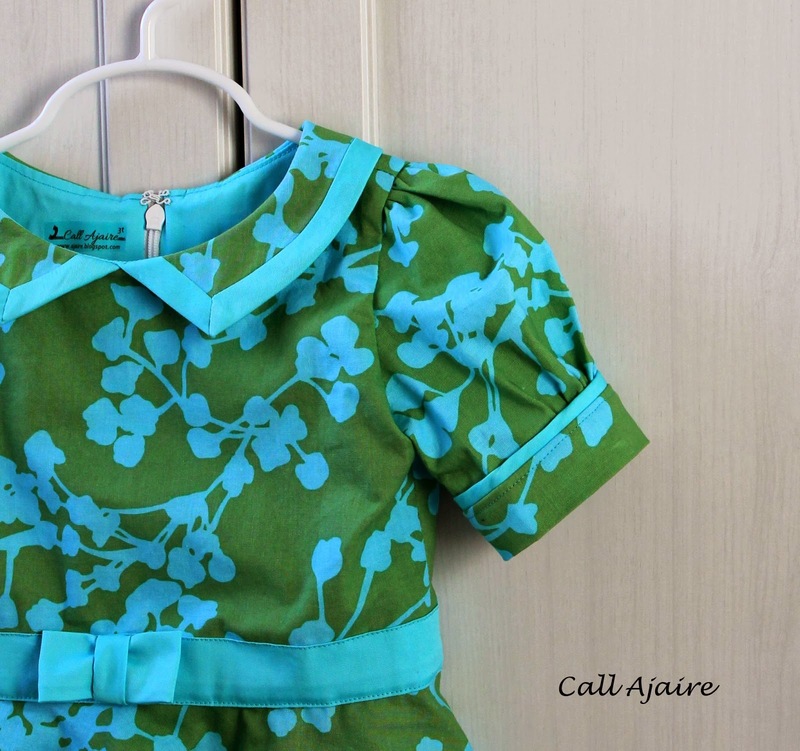 Check back next week and I’ll show you how easy sewing an invisible zipper can be. For the band I just made a tube of fabric and sewed it along the edge of the bodice and skirt so it just covered the seam, but didn’t interfere with the circle affect of the skirt. The bow was quickly made from a scrap of the band tube and a scrap of the bias binding I made for the collar and then I just hand stitched it in place. And finally I decided to bind the edge of the circle skirt. This was mostly for adding a bit more of the contrast to the edge so when worn as a top it’ll really look nice against the pants or shorts it’s worn with. But it was also an easy cheater method of wrangling that circle skirt hem. I am so happy with the bound edge. It really makes the whole dress come together for me. So what do you think? Do you think resembles the original? I cannot wait to see what the designers have come up with this week. This is one of my favorite challenges. It’s not necessarily my favorite to design, but I really enjoy seeing what everyone else comes up with. Don’t forget to check out the sew-along this week too. 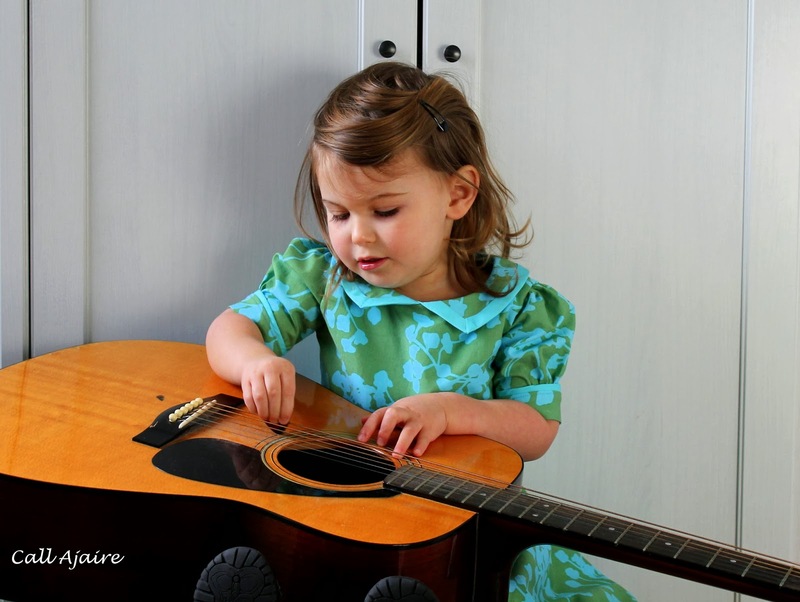 But first, I need to show you another cute picture of Bean playing her daddy’s guitar. 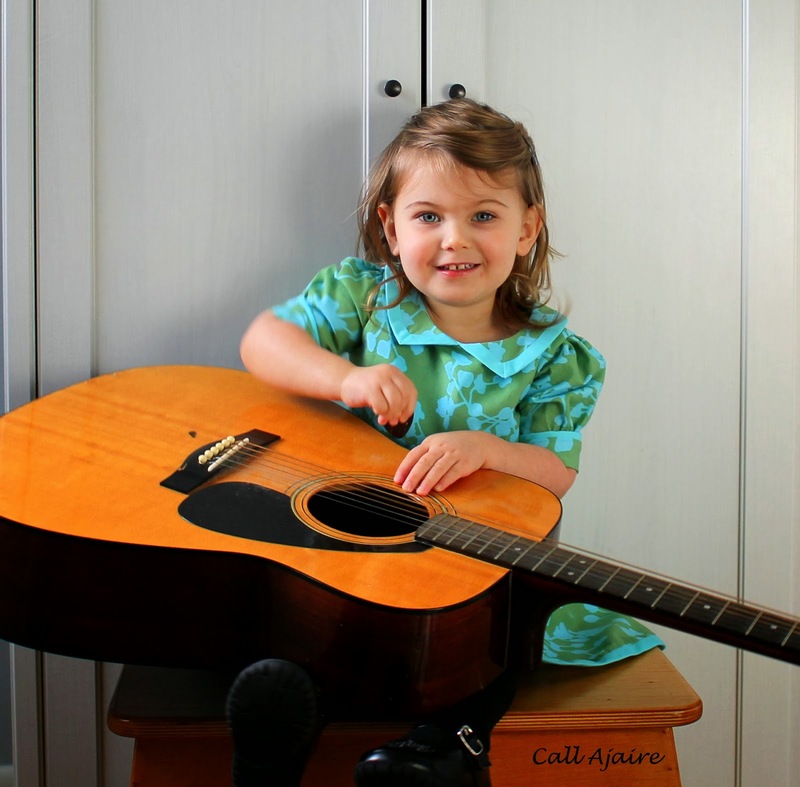 Especially since letting her play his guitar was the only real reason she was smiling in any of these pictures, hehe. 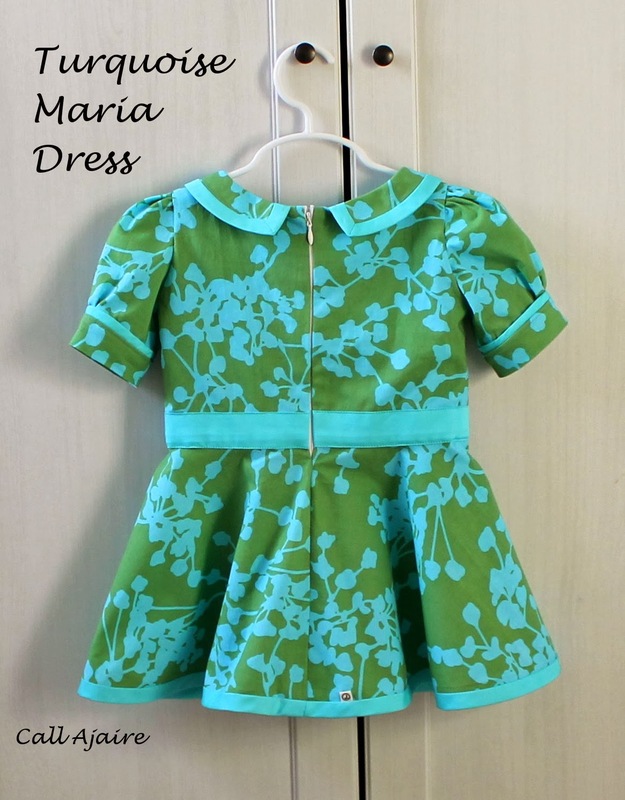 I love your maria dress! The color scheme, collar, and belt are perfect. So pretty. i so wanted to do this movie…its my all time fav!! but i couldn't think of a way to do it well. this look is amazing. and she's so cute! I love seeing the finished dress after all your IG peeks! I agree, the bound hem was perfect for this dress! Very nice interpretation of your inspiration and she looks so pleased to be wearing it! Forget the dress, that video is hysterical! What's happening to daddy's guitar???? I love how she looks like Edith Ann with that huge guitar on her lap. The colors in that dress are amazing and I love how they compliment each other. I've worn a few puffed sleeves in my day and I sure hope they are not coming back….. Better than the inspiration dress! the circle skirt was a good decision – adorable with the collar and belt. Aaaah! 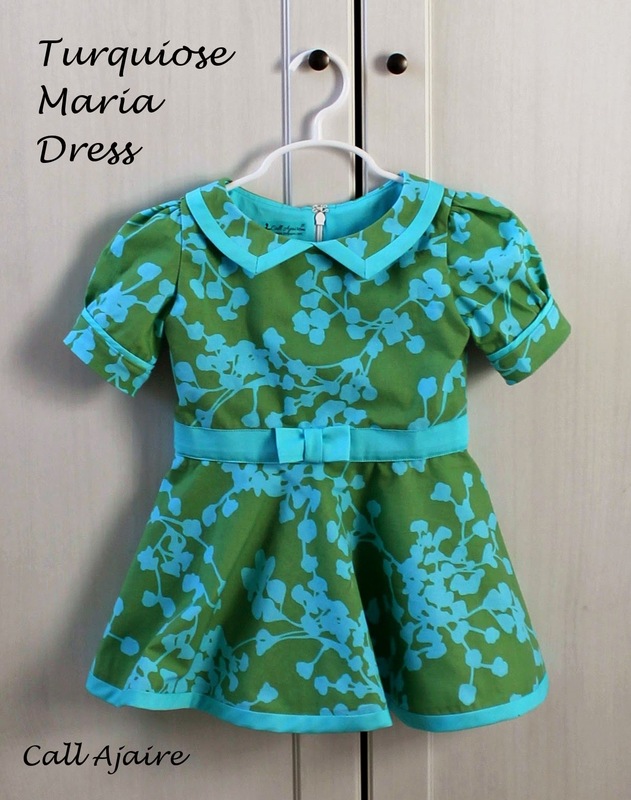 I just LOVE those colors and I think this is an adorable version of a dress that looks rather dull on an adult. You totally one-upped The Sound of Music, hahaha! So adorable!! Love the color combination. Great job! Love this dress! Beautiful colors. 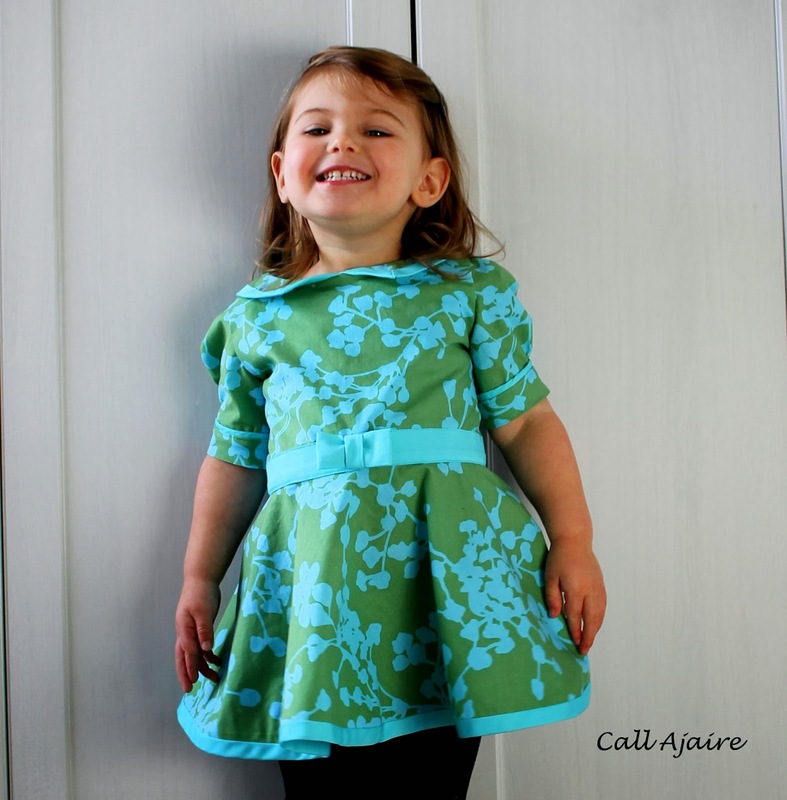 It looks great on your daughter! Very sweet. I was thinking about the sound of music and how that would be a good one for inspiration, I loved this dress and the blue one from the ball scene. I love your little dress and you can tell that you put a lot of work into it. So cute, bright and colorful! So cute! Love the bias bound collar! I love this!! The video of her singing at the end was just darling! Tell her to stop growing immediately though! She is getting far too big! Adorable. It definitely resembles the original but is even better! I love the length and those sleeves are the cutest! And I also love Anne and her puffed sleeves. Oh gosh dear this is stunning! This is my favorite look! You need to open up those closet doors and just take a picture of all the hand mades in there! I bet you never have to buy anything. Your incredible, and I love that dress! 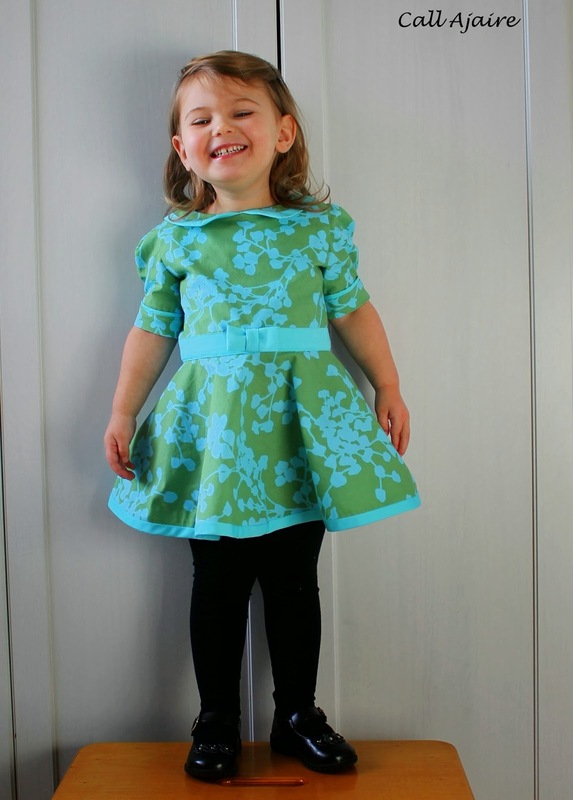 Such a pretty version of the dress for a little girl! Love the colors! 1. Love the video! Aww!! 2. You are the sew along winner this week. If not the shock would give me a stroke…because this dress us amazing! 3. I'm sort of mad I've never seen the movie!! 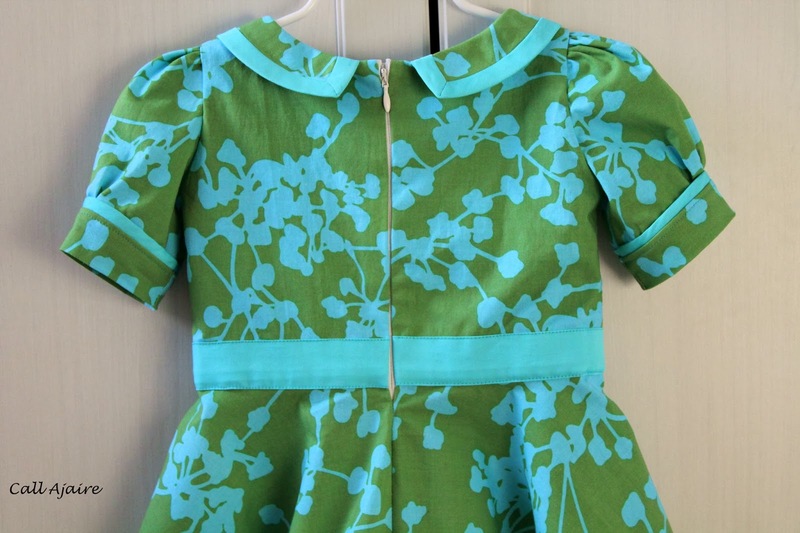 I love this 🙂 I love how it fits the original dress so well with colors and styles but is clearly modern and designed for a child. I would pay good money for this if I saw it in a store (and if I had a daughter to wear it!) 🙂 I haven't seen that movie in forever but I'll have to pay attention to that dress when I remember to watch it again! Love, love, love this movie…..and that you selected Maria's returning home garment for your inspiration!! Great job!